MIX half of the lukewarm water with sugar and yeast. Wait for the yeast to proof for about 10 to 15 minutes. The mixture will look foamy. MIX flour and salt in the bowl of your standmixer. POUR the yeast mixture into the bowl and keep on mixing until smooth. POUR in the rest of the water. 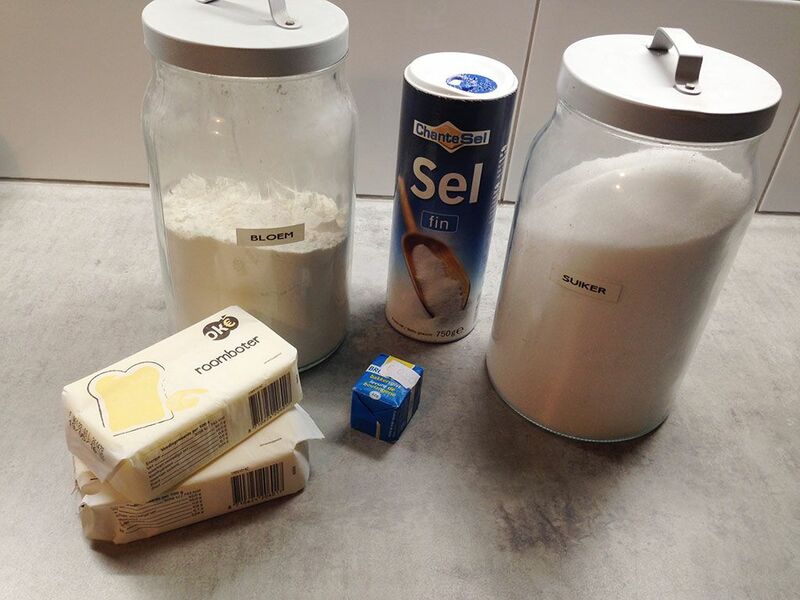 CUT 100 grams of butter into cubes, add to the standmixer little by little and combine well. Keep on mixing until the mixture becomes a quite firm dough ball. That will take about 5 minutes. COVER the bowl with cling film and let it rise on a warm place. This can be near a radiator or in an oven set to 20-25 degrees celsius or 68-77 degrees fahrenheit. This process will take about 1,5 hours, or until doubled in size. DUST your work surface with flour and place the dough ball on top. PRESS with your hands downwards to flatten the dough and create a rectangle. FOLD the rectangle inwards in thirds and then upwards ones. COVER with cling film and refrigerate overnight. You’ll notice the fluffy dough will become more firm. Meanwhile create a square of butter. The most easy way to do this, is adding 250 gram of butter to a ziplock bag. Use a rolling-pin to create the flat square of about 20 cm (8 inches). Get your dough from the fridge and let it rest on your countertop for half an hour. ROLL out the dough, and for all the other steps, keep the rectangle shape. Place the square of butter on one side of the dough and fold in the other half on top of the butter. PRESS the dough gently downwards with a rolling-pin and then roll from the center out until you’ve reached a flat rectangle. This way the butter will stay in between the dough. FOLD the left corner of the dough 2/3th to the other corner, then the right corner so they will touch again. Gently ROLL out again and then fold it in half. Repeat this step, folding it again in thirds and so on. All that folding may sound confusing, but that way the butter layers are created. WRAP the rectangle with cling film and refrigerate again for one hour. MIX 1 egg with 2 tablespoons of water to create an egg wash. Get your dough from the fridge and immediately start to ROLL it out. It’s best handled when the dough is cold, so perhaps you have to shape one half first and refrigerate the other half. 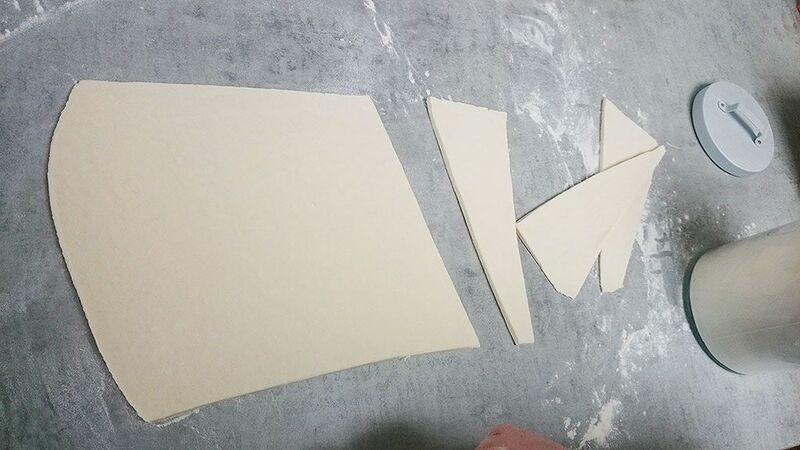 CUT the dough into triangles. 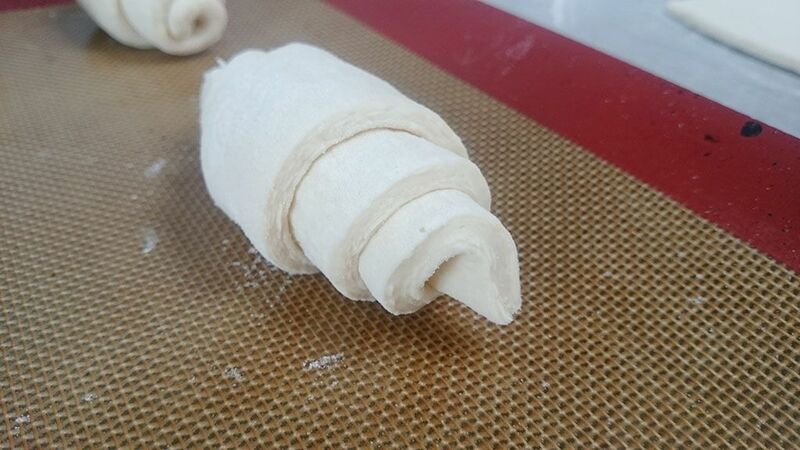 PLACE the wide size of the triangle on top and then gently roll the dough into the typical croissant shape. REPEAT for the rest of the dough and make sure your triangles aren’t too thick. PLACE the croissants on 2 or 3 separate oven trays, depending on the size. 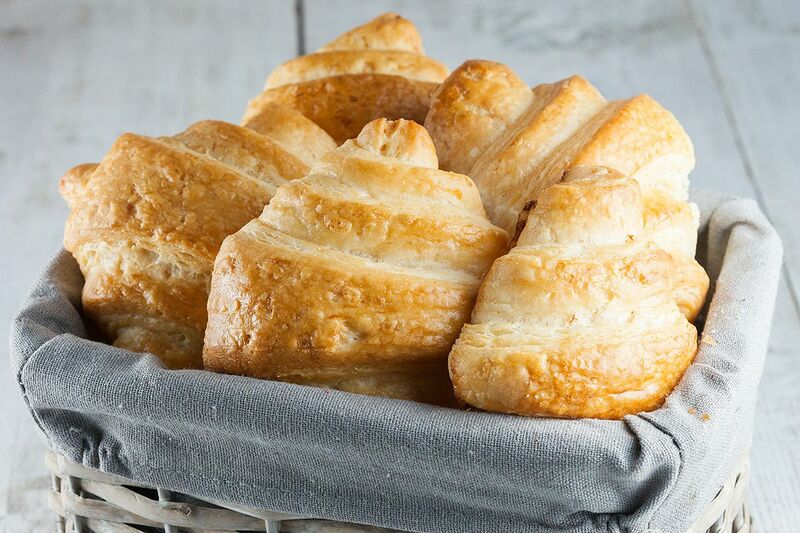 The croissants will double in size, so they need their space. COAT them with the egg wash and let them rise inside of the oven, that’s again set to 20-25 degrees celsius or 68-77 degrees fahrenheit. They will be ready after an hour, or when doubled in size. Get the oven trays from the oven and heat to 200 degrees celsius or 400 degrees fahrenheit. 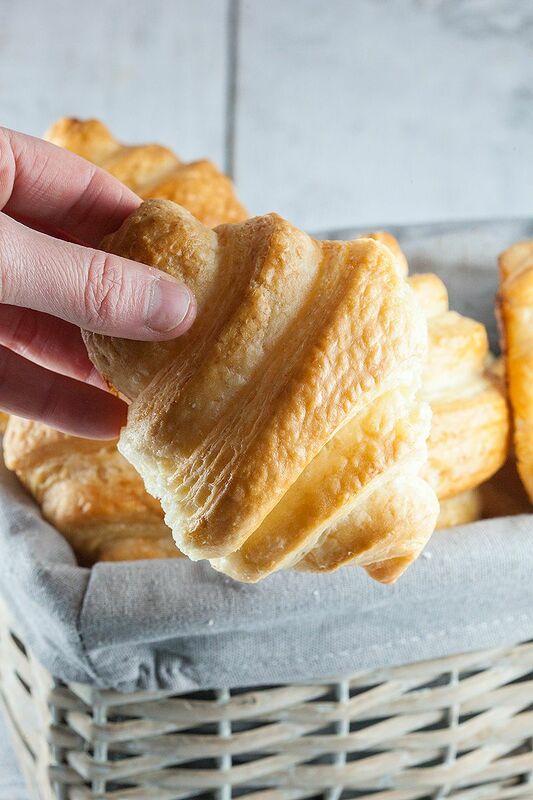 Again COAT the croissants carefully with the egg wash. BAKE the croissants for about 10 minutes, then turn down the heat to 190 degrees celsius or 375 degrees fahrenheit. 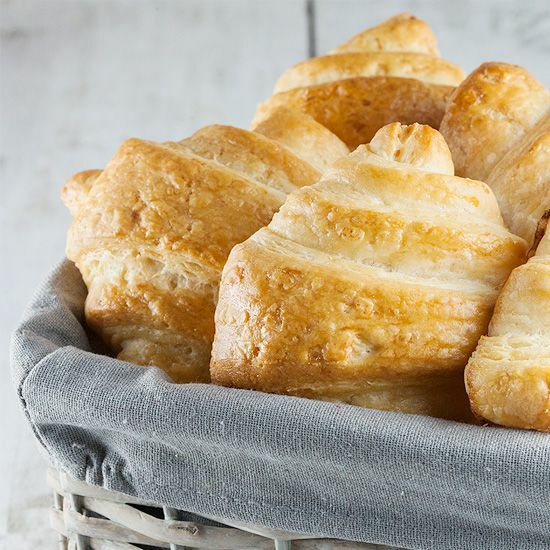 BAKE the croissants for 15 minutes more, or until beautiful golden brown. In France they like they’re croissants with jam, and of course some orange juice and coffee to complete this amazing breakfast. Enjoy!